Want to find cheap deals on best-tasting cakes online? Or maybe you're looking to make one yourself and you need cake stands, cake tins, cake toppers, or the entire baking set? Whether you're a pro at baking, a starter or you just want to get your slice or surprise someone with the most delectable cake, we bring you the latest and special offers online! Find amazing deals and voucher codes on cake baking supplies at Amazon, ebay, Tesco and House of Fraser. You can also find beautifully-crafted cakes from Sainsbury, Marks & Spencer, Morrisons for that someone very special. 300W Handheld Food & Cake Mixer - £14.95 from Amazon! Tesco is Selling a CHEESE Celebration Cake! Here at Latest Deals, our massive community of bargain hunters have found cake deals and offers online that will surely provide you with huge savings. From cake puddings to cake bars and bites, baking tools and cake decoration kits to cake merchandise, you will find the cake deal that you have been looking for. Get to know the latest cake deals, offers and voucher codes from Tesco, Laura Ashley, Amazon, ASDA, Sainsbury’s, Hobbycraft and more! Where Can I Find Good Cake Deals Online? Here is a list of where to get the right stuff to prepare that awesome cake you have been imagining for days. If you want to know how to get tremendous savings, do not forget to take a peek at the amazing offers, deals, discount codes and voucher codes by UK retailers that are featured here at Latest Deals. Tesco. You can find various types of cake treats and many party cake accessories at Tesco. Laura Ashley. If you are looking into adding a touch of elegance on your cake table, direct your attention to Laura Ashley. 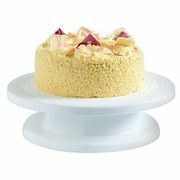 You can find gorgeous cake stands and elegant cake plates here. Amazon. The Everything Store has a good collection of anything that has any involvement with cake. You can find cake decorating craft kit, baking tools, cake toppers, and just about any cake merchandise here at Amazon. What is more is awesome is that if you are an Amazon Prime member, you can avail free shipping and other cool deals included in the membership. ASDA. ASDA is a UK-based retailer has a number of cake treats up their sleeves. If you are searching for the best cake snack to fill up your pantry, take a look at one of the largest supermarket retailers’ offers and deals. Sainsbury’s. If you are here for the cake and pre-made treats that make the cake taste even yummier, Sainsbury’s is the place to be. This is one of UK’s largest chain of supermarkets and they make sure they have enough cake treats for everybody. Hobbycraft. Hobbycraft has a wide range of baking tools and accessories for your cake preparation needs. Find cake toppers, icing, edible glitter, sprinkles and more here. Bowls. Any baker needs at least two bowls for their mixings. This tool is a must in cake preparation as this is where one combines the cake ingredients together. Measuring Cups. Being precise on the quantity of the ingredients is very important. Sometimes, all it takes to make or break the cake is the quantity of the ingredients the baker throws in to the mix. It is wise to use the correct measurement instead of just estimating it. Electric Mixer. In baking, beating is necessary. What makes baking convenient today is the affordability and usefulness of an electric mixer. This can also be used in whipping up some frosting. Cake Pans. This is where people pour in their cake mix before they pop it in the oven. There are various shapes to choose from, giving people more options to design their cake as they wish. Parchment paper – This is used to keep the serving platter clean and to line cake pans. Cake Filling. Depending on the type of cake, bakers may add cake fillings between its layers to add extra taste to the cake. Toppings. Oftentimes, people use toppings to beautify cakes and cupcakes. There are various kind of toppings for people to choose from –candy sprinkles, marshmallow, chopped nuts, dried fruit, etc. Pastry bag. This is used in decorating cakes. Bakers fill in the bag with frosting, melted chocolate, or piping gel for piping on designs (messages or patterns). Stainless Steel Mixing Bowls, Set of 6 at Amazon. This set is ideal for mixing without the unnecessary mess. It has internal mirror polishing and polished external drawing -ensuring that the bowls will remain looking new even after several years. 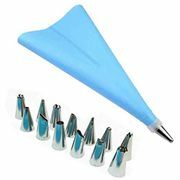 Cake Decorating Pen, Pastry Icing Piping Bag Nozzle Tool Kit at Amazon. This makes cake decoration stress-free. Children can also use this handy tool. VonShef Professional 300W Hand Mixer at Amazon. This ultimate kitchen appliance helps you whisk, mix and knead effortlessly. What a convenient addition to your kitchen. HOME Polka Dot Cake tins at Argos. In transporting a cake from one place to another, it is important that the cake has a sturdy container, and this sweet deal can do the job for you. With three tins included on the set, you will be sure that you have a tin for almost every size of round cakes. Silicone cake number moulds at Studio. This non-stick and heat resistant mould is all you need to decorate birthday cakes! There are different types of cake the Brits find themselves craving for -from light angel cake, rich chocolate cake, thick fruitcake, classic lemon drizzle cake to the traditional Battenberg cake. The UK retailers’ cake options are never-ending and the best part is that you can even easily bake your own cake from scratch. The tools needed to bake cake are also offered by these big retailers. No other cake is more British than the Battenberg cake. It is a light sponge cake that when cut in cross section, will display a check pattern interchanging the colors pink and yellow. The pieces of the cake are held together by jam. This cake originates in England, and the recipe lives on since the 1800s. What are you waiting for? Dig in to the sweetness of cake and to the various sweet deals that can be found here at Latest Deals.